Another year passed and another year that I have not met my goal of reading 52 books in one year. 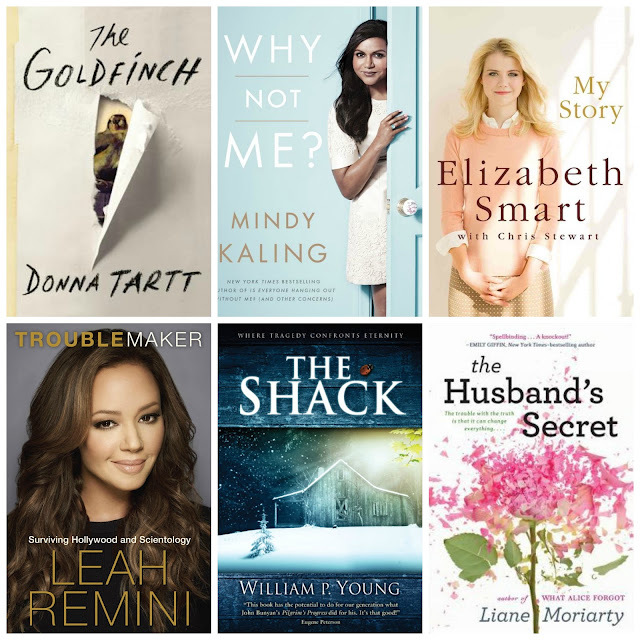 Overall I read 27 books of the 50 prompts from the 2015 POPSUGAR Reading Challenge. I enjoyed almost every single book I read. One of those I really had to plug along, but still the time spent reading is always time cherished to me. I prefer time alone reading over almost anything...almost...not over going to Disneyland...but almost over everything else. The Goldfinch by Donna Tartt was 'a book with more than 500 pages'. And let me tell you I felt every single one of those pages. This is the kind of book that goes into extreme detail over everything that then has you wondering what the flinch from a character really means. Nothing. It means nothing. But there you go taking this journey with Theodore Decker who endures loss after loss in his life. I was well over 200 pages in and I still had no clue what the main story line was. I would get really overwhelmed because I had read so many positive reviews over this 2014 Pulitzer Prize winning book and yet I could not get behind it. Finally they introduced a dog into the story line and that became my entire drive to get through the book. I needed to know that the dog ended up having a happily ever after ending. Towards the end of the book, the story line took a mobster like turn with yet more unbelievable trials and losses. I feel as if this story could have been told in about 300 pages and been a much better book. Why Not Me? by Mindy Kaling was 'a funny book' and just what I needed after my previous book. Kaling picks up where she left off in her previous book and takes on even more hilarious anecdotes of her life. This is a really light hearted book that I read in 2 days. I really enjoy her writing and her works and hope another book is in the making. My Story by Elizabeth Smart was 'a book that scares you'. I was only a few years younger than Elizabeth when she was captured. I remember obsessively following the story along with my mom. Nothing like this had ever happened and I was terrified that one day this could somehow be me. Days stretched into weeks which stretched into months. I hurt every time I would see her parents on television and would steal side glances at mine thinking how I would never wish this pain upon them. Upon anyone. I rejoiced with the rest of the world at her coming home. I thought 'she is o.k. and everything will go back to normal for her'. Never did I imagine all that would come to light in the weeks there after. In her book, Smart recounts her time spent in captivity. She endured more pain and traumatic experiences than any child should ever have to and yet the entire time that I was reading this book I was amazed and consumed by the amount of faith and love she has for God. Her faith never faltered and she knew God would deliver her to safety one day. And He did. I hope and pray that one day I can have an ounce of the kind of devotion that Smart has. My obsession for her has never waned over the years. Every so often I have looked into her life and have been so happy at all her milestones: college, mission work, marriage, and a baby. She has found a way to put all her pain behind her and really focus on the beauty of life. Troublemaker by Leah Remini was 'a nonfiction book'. An inside look into the controversial Church of Scientology by a celebrity? You can practically hear the clicks of the paparazzi cameras as you turned the pages! All kidding aside, I can't imagine devoting all my life and time to my church only to be let down and ousted by them. You can choose to believe Remini or not, but I felt for her and hope that the void of no longer living in community has been filled for her. The Shack by William P. Young was 'a book that made you cry'. I took my time with this one because once God, Jesus, and The Holy Spirit starting talking I felt like I was reading the Bible and I should pay close attention and take notes. The gut wrenching story of what happened to Macs' daughter tore at me. A life lost is difficult enough to deal with without it being the life of a child. Add to that the gruesome way in which she died and it was enough to make me loose it. The way in which Mac finally receives peace over The Great Sadness is a wonderful story. A bit difficult for me to follow at times but the overall message of God's love and devotion to his people was not missed. The Husband's Secret by Liane Moriarty was 'a book set somewhere you've always wanted to visit'. I really enjoy books with various groups of characters who all intertwine. It is as though the reader is always a step ahead of the characters. This book was set in Australia which is a place on my bucket list. With each chapter, Moriarty gave us a little more insight into the characters personal story. Many things I wasn't expecting and it kept my attention well. Of course there is the question 'What was the husbands secret?'. Read it and find out! Another thing I enjoyed about this book was the ending. More personal insights into what was and what could have been answering any and all questions. Sighing into the ironic turns of life. Don't forget that Life in Mascara Book Club starts today! Don't forget to follow along!